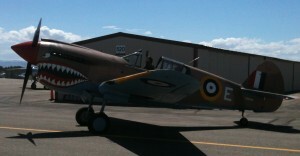 To commemorate the independence of the good ole’ US of A my son and I strolled over to the World War II Warhawk Air Museum here in Nampa, Idaho. Over the weekend they were hosting an event complete with flights of many of their aircraft (and some on loan). Of course the whole outing was under the guise of “something good for our son to do.” Fifteen minutes into the excursion and he starting complaining about his stomach hurting. Well, that forced me to reveal the truth of the situation–that I wasn’t about to leave until I got to see some WWII planes buzz the tower.